It turns out they’d been really busy in my absence. 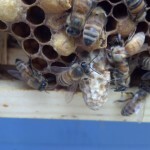 When I picked up the bees and moved the frames from the box into my hive, I spied several queen cups (cells created specially to make new queens) along the bottoms of a couple of the frames. That usually means they’ve run out of room and are preparing to swarm. I destroyed the cups and put them in the hive with lots of space, hoping they’d decide not to swarm. New Vulcan colonized. I went back a week later and found a lovely little capped queen cell–which meant I’d apparently missed a cup the week before when I’d destroyed the rest and that they’d already swarmed at that point. Blarg. At that point, I decided to just leave it and let them raise the queen. At the same time, the OTHER colony (Andoria) looked like they were raising a queen, as well, I guessed because the existing one wasn’t laying very well or they didn’t like her for some other reason; I hadn’t seen very many eggs on earlier inspections. And then I proceeded to leave town for a conference. 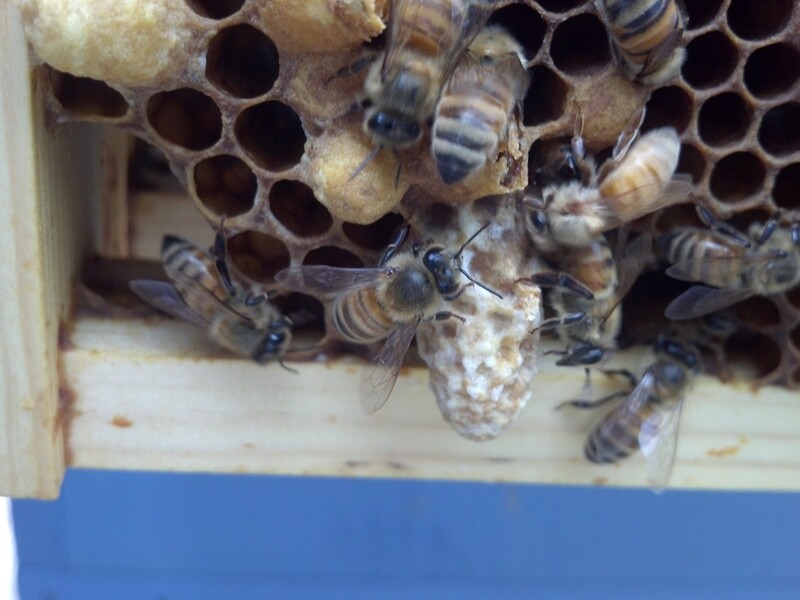 I spent the next couple of days debating whether I should indeed just let these colonies raise their own queens or try to find an already-mated queen for sale to install. I finally decided to buy a queen, since raising one meant it would be at least a month until she was laying (she’d have to emerge from her cell, get strong, go mate, then start laying–assuming she even survived her mating flight), meaning the colony would be set back in bee production and therefore honey production. So I found a queen for sale nearby and ordered. (Thanks, Aaron!) Since I had been a good little energy worker and carpooled to the conference, my boss was nice enough to take a short detour on the way home to pick up my queen. This was last Thursday. I didn’t get home that night until about 7, but I wanted to see what was going on in the hives. Turns out Andoria (the one that overwintered with the crappy queen and the one I’d decided to put the new queen in) had a ton of eggs, so apparently they’d already raised a healthy queen or the existing one stepped up her game. So there was no reason to mess with that one.